While most Djiboutians are Sunni Muslim, smaller pockets of other faiths continue to exist in the country. 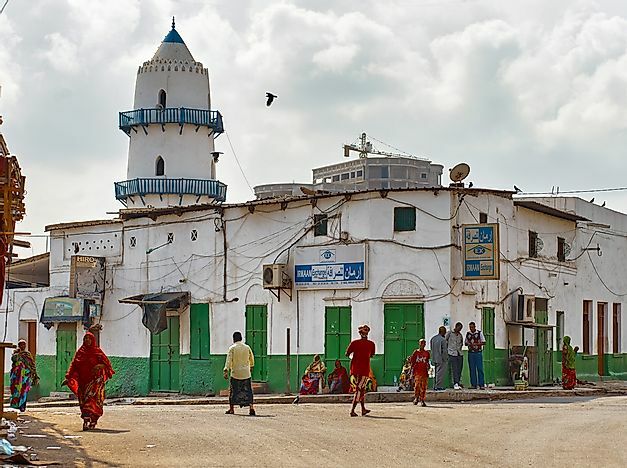 A view of a main street in Djibouti with a mosque at its center. Editorial credit: Truba7113 / Shutterstock.com. Djibouti is an African country located in the eastern horn of the continent, otherwise known as the Horn of Africa. The population size is estimated at around 828,324 and is mainly made up of Somali and Afar ethnicities. Arabs, Ethiopians, French, and Italian ethnicities make up a 5% minority. Approximately 24% of the population does not live in urban areas, and these people practice livestock herding as a form of living. Inhabitants of this country speak either Somali or Afar languages although the official languages of the government are Arabic and French. The government protects the freedom to practice religion under the constitution and other policies and laws. However, the nation has proclaimed Islam as the state religion. Government officials, including the president, are required to take a religious oath. In civil matters, civil marriage is permitted only for foreign, non-Muslim residents. Muslims are required to have a religious wedding ceremony. Additionally, a Muslim woman may only marry a non-Muslim man after he converts to Islam. The US Department of State reported that Djibouti does experience some instances of social discrimination based on religious identification and that customs discourage religious conversion attempts. Neither human rights violations based on religious affiliation nor religious prisoners have been reported. The religious majority in Djibouti is made up of followers of Islam. In fact, 94% of the population identifies as Muslim. Islam has been practiced in the area for centuries, beginning with Muslim refugees during the life of the prophet Muhammed. The religion stayed mainly along the coastal areas of the country until African traders introduced the beliefs farther inland. Today, the majority of this religious population follows the Sunni denomination which has also influenced local laws, customs, and architecture. Each urban center within Djibouti has at least one Mosque for religious observations. Nationally recognized holidays are mainly Muslim, including Ramadan, Eid-al-Fitr, Eid-al-Adha, and the Islamic New Year although, Christmas is also popular. The holiest place in the country is the Goda Mountains which hold the tomb of Sheikh Abu Yazid. The remaining 6% of the population identify as one of the several Christian denominations. The majority of these individuals are made up of Ethiopian Orthodox or Roman Catholics of Ethiopian and European descent. A very small percentage of native Djiboutians are Christians. The Orthodox religion has been introduced by Ethiopian immigrants. The Catholic religion was introduced a little over 100 years ago by Franciscan Capuchins who built health and educational facilities. Since public proselytizing is not common, and actually prohibited by Christians, Muslims and Christians share an environment of religious tolerance. The majority of newcomers to these faiths are immigrants to the country. Given the recognition of Christianity, these individuals can easily find Christian religious centers to practice their faith and meet up with others of the same beliefs. Very few Muslims convert to Christianity, and when they do, their families often ostracize them. To avoid this, they practice their new found faith in secret. Upon their deaths, the families practice traditional Muslim burial customs rather than Christian.